The rice cooker has been a boon to eating healthy for me. Honestly, cooking rice on the stove top is difficult. Most times, I would end up with a sticky glue instead of fluffy rice. Brown rice and other whole grains are even harder. Now, I just cook up three to six servings of rice, divide them up into Ziploc bowls and put them into the refrigerator to eat in a myriad of ways. Optional additions: Two sprigs of fresh cilantro and/or a few drops of Tabasco sauce. These are the ingredient sizes for one serving. It’s a HUGE serving, so you might want to cut everything in half if you have a small appetite. Put all the ingredients in a bowl and microwave for 2 minutes. Mix together and add the fresh cilantro and Tabasco sauce for extra flavor. If you are following the Weight Watchers Core Plan, this is also a Core Food. 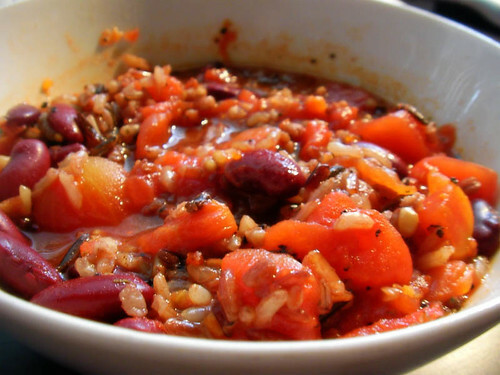 It counts as one serving of whole grains, one serving of lean protein and two servings of vegetables. 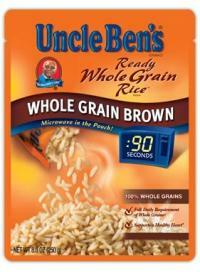 If you don’t own a rice cooker or know how to make brown rice on the stove, you can purchase pre-cooked packets of brown rice from Uncle Ben’s. It’s not quite as good as making it yourself, but it’s really easy. If you try this recipe, please leave comments here about how you made it better. Considering how horrible a cook I am, I’m SURE there are ways to make it better! I do a similar rice thing, but I change it out a bit. I cook the onion and mushrooms in a small pan with the sauces for a few minutes while the rice cooks, then mix the whole thing together in a bowl. I used eTools and calcalated the Points for this recipe as less than you thought! You know what brand of rice and beans you used, so you know the specific nutitional information. That’s 3 Points for the whole dish, which means that there’s plenty of space for some chicken or beef. Thanks for the recipe! I plan on trying it soon. Good catch! I forgot to calculate the fiber into these and just did a quickie estimate. Because of the fiber they ARE lower than I originally calculated.